In a world of digitization, one of the top priorities for many CEOs is implementing modern methods for reaching and attracting new business. This is why many have turned to digital marketing strategies like SEO (search engine optimization) to boost sales. 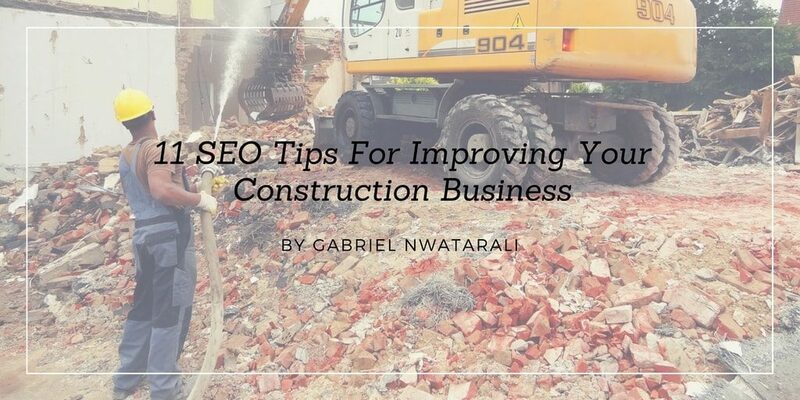 If you want to turn your construction business’s website into an invaluable asset that can help you increase revenues, then you’ve come to the right place. SEO refers to the process of optimizing web pages to increase their visibility in search engine results pages (SERPs). And it’s perhaps, the most important online marketing strategy of the 21st century. You see, consumers have gone digital and they’re enjoying themselves. With entertainment companies like Netflix & YouTube leading the pack, people no longer have to sit through ads anymore. That’s right, no one wants to be interrupted by your ad. This is why YouTube lets people skip ads or opt-in for YouTube Red and Netflix removed them entirely. They know that ads are annoying to most Internet users. It’s not like back in the day when more people tolerated watching Wonder Bread and milk commercials as they watched TV while enjoying a bowl of Orville Redenbacher. These days, consumers are more interested in connecting with companies or brands. So they’ve thought themselves to ignore a lot of old school paid advertising tactics. This new behavior has plummeted the effectiveness of traditional ads like TV, radio and print media. However, there’s still a place for traditional marketing and depending on the nature of your business, they can be effective. SEO is a highly technical strategy to execute and content marketing is a big part of it. From keyword research to creating content on or off-site and promoting publications, it’s all very time-consuming and mistakes can hurt big time! This is why business owners hire marketing agencies/professionals to handle it. Search engines have become the preferred choice for finding products. Let’s be real, when was the last time you used a physical phone book? Nowadays all you have to do is search for what you’re looking for in Google or Bing to instantly get all the information you need. In fact, 80 percent of local searches lead to a conversion (or sale). And there are over 6.5 billion searches performed worldwide DAILY! Ok, but wouldn’t paid ads on Google and Bing just get all the clicks from search anyways? No, they actually get way less because, on a large scale, consumers don’t trust paid advertising. This is not to say that paid ads don’t work because they do when implemented properly. Also, since search engines were originally intended as free resource libraries or directories, people use them for that purpose. 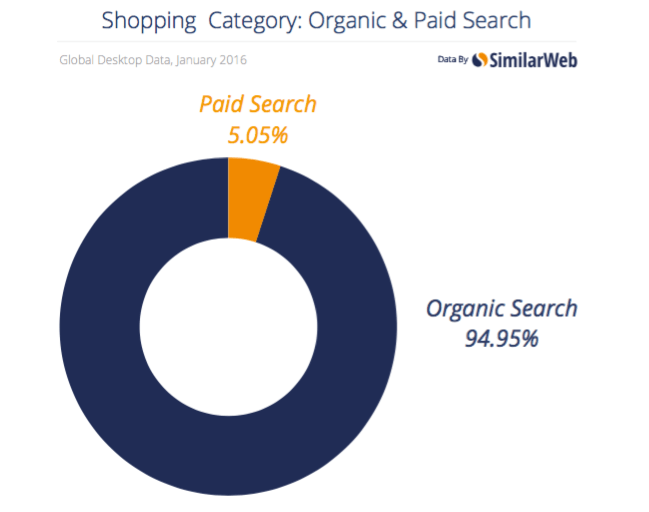 Look at the percentage of clicks on paid vs. organic (or free) search results? As you can see, people click on organic results more than they do for paid ads. So how can your organization use SEO? To obtain leads and attract more clients, that’s how. Here are several success tips for your campaign. In any marketing campaign, the first step is to know your target audience. And merely knowing who they are isn’t enough; you also need to go a bit deeper than that. You need to understand their potential personal & professional backgrounds, interests, challenges etc. This is why it’s a good idea to conduct a buyer persona exercise. Personas are fictional representations of your ideal customers. The process of developing buyer personas can give you insights that you otherwise may not have thought of. There are several questions that you should ask yourself when conducting this exercise. Questions can vary depending on the kind of business but for most, the following will do. What are their likely educational backgrounds? What are their probable careers? How big is their company or the one they work for? What are their likely job roles or titles? What are the required skills for their job? What does success mean in their roles? How do they learn or consume new information? Which blogs or forums do they read or engage with? Which social networks do they hang out in? How do they interact with businesses? Do they use the Internet to search for information? How do they search for info? A lot of research is needed to answer these questions but you can also use existing customers as a benchmark for creating your personas. 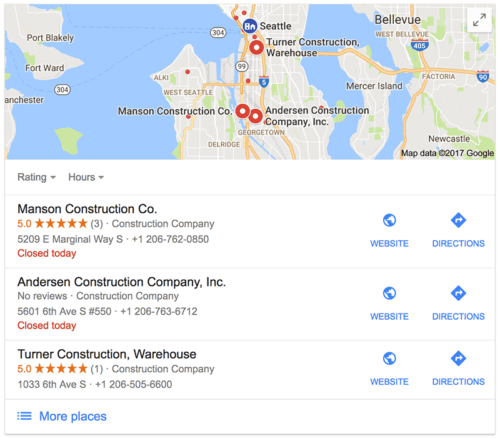 A Google My Business and Bing places listing are critical to SEO, especially for construction companies because local search is how most of their customers find them. Sometimes mistakes happen and a common one among web developers plus marketers is accidentally blocking search engine bots. There’s this thing called a robots.txt file and website owners use it to give specific instructions to bots, who come to crawl their sites. The following will tell bots to crawl everything on your site. Now, all it takes is for someone to add a “/” right after “Disallow” to tell bots not to crawl any pages on your site. This happens more often than most people think. 4. What’s Your Content Strategy? This refers to your plan for creating and delivering content to your audience. People go to search engines for information and content is how you capture eyeballs. So you need a robust content strategy for attracting new visitors and converting them into paying customers. Contrary to popular belief, you don’t have to create an endless amount of content on your site to do this well. You’ve probably heard it before, you know, post 16+ amazing content consistently to accomplish good search engine rankings but this is largely false. Yes, this strategy may work for media companies, bloggers or other content-heavy industries but not a construction business. Instead, publish enough valuable content on your website and focus the rest of your efforts on promoting your business off-site (on other reputable sites). Things like guest posting, getting interviewed and video creation are great ways of doing this. Decide which keywords are most important to you and focus your content strategy on them. You should have primary and secondary keywords in your list. Your prime keywords are the ones that you absolutely must rank for such as “landscaping company in Ottawa” or “construction business in Kanata”. Your secondary or supporting keywords are the ones that you can create marketing content for. Essentially, these are problems that you can solve for your ideal customer to get noticed such as “how to make your home energy efficient” or “low-cost renovation ideas”. Make sure that your web pages are properly optimized to encourage favorable actions like initiating contact or signing up for your newsletter. Conversion rate optimization (CRO) is huge because it’s how you get people to buy stuff online. It refers to the process of increasing the percentage of website visitors who convert into paying customers or take any desired actions. Fortunately, you don’t have to spend hours upon hours trying to figure out how to increase your conversion rate. Just download this: 32 Ways to Increase Your Website Conversion Rate. We’ve written extensively about backlinks and they remain an ultra-important ranking factor for search engines. Regardless of the fact that search engine algorithms have gotten smarter, links pointing to your website are still a game changer in SEO. Search engines consider them as votes and the more links you have on other sites, the better you’re likely to rank in the SERPs. The goal is to build links naturally but in the beginning, you may have to do some outreach or press releases for links. Links aren’t everything or some magic bullet in SEO. In fact, they can hurt you if your on-page optimization is off-point. UX or user experience and building an authentic brand trumps backlinks every time. Links are only a piece of the puzzle, not the be-all and end-all. >> RELATED: How to Build Backlinks to Your Website. Social media has quickly become an integral part of online marketing and there are ample opportunities for construction companies in this area. When executed correctly, social media can help raise brand awareness or improve brand recognition and increase sales. For example, showing off your completed work on Facebook or Instagram is a great way to attract new business to your construction company. But how does this help your SEO? Simply put, the more you share your content on social media, the more people you reach and expose your business to. Hence, reaching people who potentially have the ability to amplify your content (even more exposure, YAY). As mentioned earlier, backlinks are an important ranking factor but internal links are too. The way you link to individual web pages on your website matters! Remember when we discussed keywords and why having a primary, including secondary keyword goals, are important? Well, that’s sort of where this comes in. You need to point links from your secondary web pages (with keywords) to your primary ones. This is how you distribute links (or link juice) to the main pages that you want to rank for. How you structure your URL is important. Search engines want human-friendly links and incidentally, it’s also better for the user. Which of these are easier to remember? The latter is obviously NOT the better choice. This is partly why your link structure matters. The other reason is that you get a slight boost in rankings when your URLs are human-friendly and contain your keywords. Remove or compress anything that takes a long time to load. 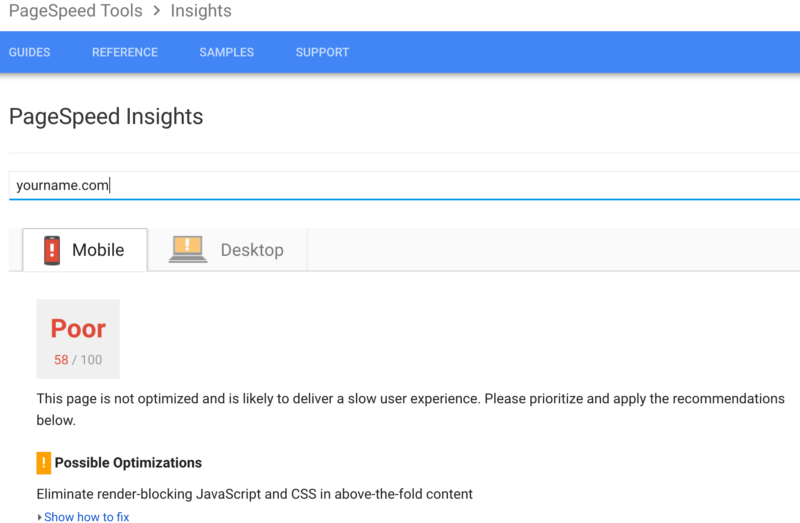 Use Google Pagespeed Insights to speed up your site, which you can access here. Enter your web address and click on “analyze” to get your results. As you can see on the above screenshot, Google lets you know how to fix these issues. Copywriters are people who write the advertisement or other public copy. Similar to salespeople, their focus is to encourage behaviors that favor a given organization or business. Government agencies, not-for-profits and plenty of businesses use copywriters to convey their messages in a concise, attractive and likable manner. So why should you hire one? The obvious reason is that you’ll sell more of your stuff. Then there’s brand storytelling and speeding up the know-like-trust factor. If people know about your business and they like plus trust you, they’ll most likely buy from you too. Hire a copywriter today. We asked some professionals to share their best piece of SEO advice. This is what they had to say. In SEO we used to say that quality is more important than quantity and while this is still true, you also need to pay attention to quantity too. If you can prepare high quality long-form content on a consistent basis, you’ll be a step closer to SEO success. It doesn’t matter how well you rank, if the time spent on your site by your customer is frustrating them. Visit your site from a mobile phone, not a simulator and evaluate the user experience. Test your forms, test your menus, test your shopping cart and test your performance speed. Build your site for your users and not for Google. In addition to making sure your important website pages, including your homepage, are optimized with important keyword phrases and match with your pages H1 tag, the best single advice I can give is to consistently blog every month. The more the better and if you tailor your blogs to answer pressing questions your potential clientele might have, the better results you will gain. Not only does blogging increase possible web traffic from the blog article itself, but it also gets the Google spiders to index your site more frequently. And the more the Google spiders visit your site, the more your site pages get found and help increase your overall web traffic. My single best SEO advice to website owners is to clearly identify their goals and objectives before engaging in campaigns. In my practice, I often meet with site owners whose one and only goal is “to be on the first page of Google” and therefore the only KPI they focus on is keyword rankings. However, there are other important goals in SEO such as conversation rate optimization, content reach or content engagement that often stays overlooked. Setting realistic goals and assessing them with achievable measurements will help you strengthen your strategy. Check your assumptions, and the client’s assumptions at the door. I can’t tell you how many times I’ve talked to clients who have assured me that “all our revenue comes from (product/service x)” just to find out that it’s not that black and white. They also assume that because that’s their current revenue winner that it MUST be the focal point of your campaign. You have to take a step back and understand the FULL funnel that traffic goes through, from query to page, to conversion form, email or call. Then BEYOND that to who is following up with leads, how products are fulfilled all the way to the end. Once you understand the complete process, then you can start connecting that funnel to the queries that best match those searchers intentions to actually generate additional revenue consistently. Biggest 2 SEO tips –> 1) Get a faster server, and 2) Get better conversions / satisfy the search better. Yes you! DO IT! Do your research! Keyword research is “key” (pun intended). Optimizing any type of content is completely pointless if you don’t have the necessary keyword and competitive research! My single best piece of SEO advice is to focus on creating the best user experience (UX). Optimizing UX is nothing but focusing on what the visitor wants. There is a whole field of UX optimization that needs a great level of expertise. Search engines have become the most advanced data mining tools – as they help people find what they want. Algorithms get tweaked to give users more of what they want. Websites that do a better job of meeting the need of searchers have a better chance of landing on the first page of search results. In this case, anything you do for search engines is meant for searchers. SEOs should go beyond what search engines want and look for ways to improve overall user experience. They have highly emphasized user experience, relegating many traditional strategies. You need to create a user experience that draws people, addresses their needs and compels them to convert. In short, creating a unique and satisfying user experience is the key to a successful campaign. User experience is as important as visual identity and it doesn’t matter how your site looks like if people are not able to interact with it properly.